Sheree Trotter spoke to Brad Haami about the Welcoming the King of Glory conference held in Abu Ghosh/Kiryat Ye’arim, on October 10-13, 2017. A number of Pacific and Māori communities have, over a long period, spoken of a “deep sea canoe vision” from the Pacific to Israel. The late Monty Ohio told of a canoe (vaka loa) returning to Israel and Rev Michael Maeli’au of the Solomon Islands shared a vision of “the glory of God returning to Israel via the Pacific”. For many years, Milo Si’lata of the Pacific Prayer Network, and others, sought to share this vision with the messianic Jewish community in Israel. That opportunity came earlier this year when Milo communicated the desire of the indigenous groups of the Pacific to come to Israel and meet with the indigenous people of the land. After a time of consideration, the messianic leaders extended the invitation for the nations to come and join them in celebrating the Feast of Tabernacles. Many nations participated in the Welcoming the King of Glory event. Solomon Islands, Hawaii, New Caledonia, Vanuatu, Papua New Guinea, Samoa, American Samoa, Tonga, Hawaii, Native Americans, Ukraine, Europe, Australia, Africa, South Africa, Mongolia, China, US, and Japan sent delegations. The New Zealand contingent included Māori, Pacific and Pākehā from a number of different ministries and denominations. Messianic leader, Avi Mizrachi, saw special significance in the indigenous ministry leaders approaching Israel’s ministry leaders in this way. ‘It is significant that they are the first international Christians to recognize correct protocol for coming up to Jerusalem to keep the feast of Tabernacles. It is a historical first’. 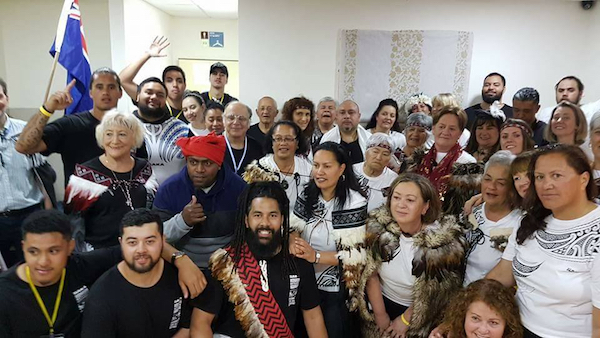 We interviewed Brad Haami, leader of the New Zealand Māori contingent. Q: Please tell us more about the way this event came to pass. A: As a group of Māori and Pacific peoples we agreed we could only come if the Messianic Jewish community opened the door for us. We didn’t want to walk into a nation and impose our ideas of Christian identity and Pacific identity on that land. We had to come through the open door of the indigenous people of that land. As indigenous people, it was important for us that the tangata whenua* of that land extend the invitation for us to come as manuhiri* to the territory over which they hold mana*. We are a people of protocol and I think it’s also something that God desires. He is a God of honour and we needed to move in the realm of honour as well. We wanted to give the mana* to the messianic Jewish community to host and stand up as the older brother. Q: Tell us more about your team and what took place at the conference. A: There were 24 of us who travelled together and we were joined by another 50 Māori, Pākehā and Pacifika at the conference. We had seven kaumatua* over 70 years old, steeped in knowledge of the language and identity in God. This was important for us as we believe the mana* of your people resides in your elders. The various groups and tribes had the opportunity to present gifts and offer cultural performances that expressed honour and repentance towards the Jewish people. Our group entered in total silence apart from the beating of the poi. * This was an act of submission, rather than imposing our culture. Revelation 5:8 was our model. We offered gifts of 24 precious paua* shells, which symbolised the tears and prayers of our people for that land and people. Q: What were your impressions of Israel as a first time visitor? A: We stayed in the Arab quarter and our hotel had a great view over the old city. You can go to Israel and you can pick sides whether you’re with the Jews or the Arabs. Our love for the Jews is a given, but all of us learned to have a heart for the Arabs as well. Despite all the conflicts going on – the love for the people grew in us as we were in their midst. There were a few dangerous moments there but people wanted to engage with us. We loved being in that space and getting a taste for that land. It’s only as big as Northland, but the whole world has got a piece of their finger in there. You’ve got to ask, what is that all about? Who are we to go and tell them what to do over there? Eight of our Māori team got baptised in the Mediterranean Ocean. As Māori we were very conscious of what was under our feet, that we were walking on bones everywhere. We were learning and walking on history and battle fields. We had karakia* to remove the dust – death and blood and burial grounds off our feet. Q: What did you take away from the experience? A: We came away with the idea of forging strong links and relationships between Jew and Gentile. One of the big conversations that came out of this gathering was putting things in order and alignment to the way God is moving and the idea of creating one new man between Jew and Gentile. There’s an order in the way that we as the church should move. Within our own nations we have to manage the way we work together and honour. This is a minefield, to really get to true relationship between us because of cultural ideas and covenantal issues. It’s about how we’re meant to walk together in order. This article was originally published in the Times of Israel.